Who better to design them than the quintessential New Yorker, David Byrne himself. 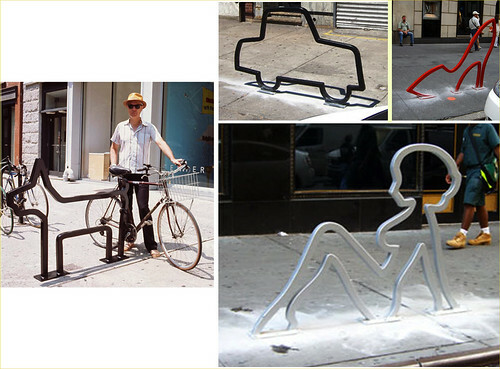 I found the link via Designboom. It was originally posted on Gothamist. So it seems I’m perhaps the last New Yorker to find out about it. But I did and I’m sharing it with you, my dear Maquette readers and friends. Who knew that David Byrne had his own blog? Well he does. On it, he explains how he entered the NY Dept of transportation’s contest as a judge but then submitted his own designs which they of course jumped at (It’s David Byrne after all). This guy has no red tape whatsoever!! He went to his friends at little old Pace gallery (I’m being sarcastic, Pace is not little!) who agreed “to cover the costs of fabrication and then possibly sell these items as original works down the line. They responded quickly, too â€” also with yes and yes! (make and sell.)-D.B”. Holy moly, can you image being that kind of celebrity that every art project idea you have can be made and fabricated civically and in the fine art world? Oh David Byrne, you’re a genius and deserve to see the fruition of your ideas. I remember being a little kid at big loft parties at my parent’s friends loft in Tribeca. All of the adults danced to Talking Heads and I sat on a giant blow-up crocodile raft watching them. Tribeca was not upscale then. Anyway, I love David’s sketches, they’re really fun. Check out his blog to see them. I was wondering if you were going to shout me out. I don’t have words for how much I love this guy. There’s a new Brian Eno/David Byrne album out that your fans should check out. Oh cool. I’ll try to find it and post a link. Of course I’d shout you out. I know how much you love DB! I love these and can’t wait to get a chance to see them again. oh good!!! Glad I could remind you of them!